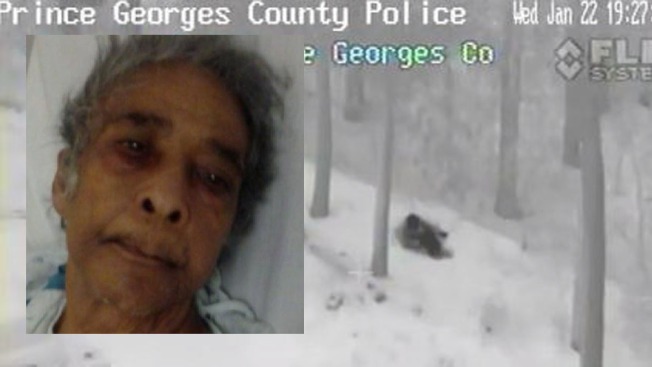 Prince George's County Police successfully rescued a 79-year-old woman who had fallen in the snowy woods Wednesday, while the temperature lingered in the single digits. News4's Tracee Wilkins spoke with the woman's daughter, Maggie Dickens. Dickens said she left her mom in the passenger's seat for a quick moment while she ran out of her car. Her mom, who was recently diagnosed with dementia, was gone when Dickens returned to her car. "I just thought that I had killed my mom... I just thought that I shouldn't have left her by herself," she said. "With it being so cold, we knew time was of the essence so when we got the call, we jumped in the aircraft and went searching," Cpl. Bo Corser with Prince George's County Police said. Corser and other officers used heat-detecting cameras to find the woman in the back of an apartment complex, right by a wooded area. From there, the rescue took minutes. Dramatic chopper video captures the rescue, as police and lead officers on the ground to her. "Ok, we got a suspect," officers are heard saying on the video, as they approach the woman huddled in the snow. "It's her." "She's just now learning what [her dementia means]," Dickens said. "She's thankful to the Prince George's Police Department. Because of them, she was safe at home this morning. She brought me into the world so I'm going to do the best I can for my mom."